Just a short note to close out the work week. 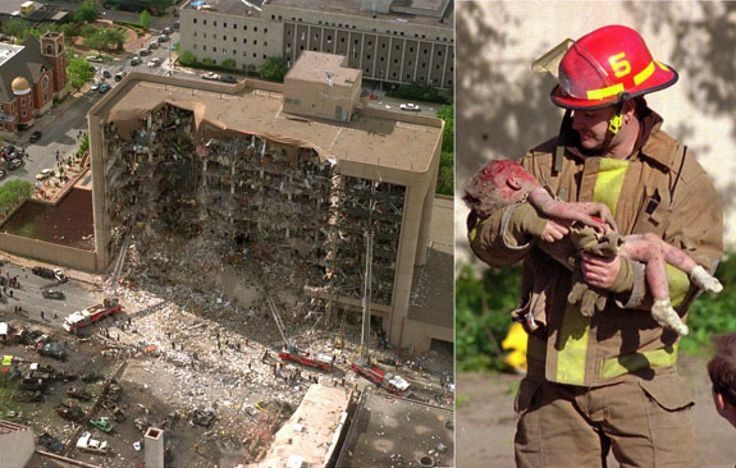 Amid all the political drama surrounding President Trump, James Comey, and the release of the Comey memos this week, one thing that was overlooked by most people was the anniversary of the bombing of the Murrah Federal Building by Timothy McVeigh and Terry Nichols in 1995. I don’t think that I could ever forget the day. I was working as a hospital ER department chaplain where I worked a 3:00-11:00 shift and usually didn’t get to bed until one or two in the morning. I was also a Chaplain in the Army National Guard. Not long after I got up I turned on the news and was drinking my coffee when the news about the bombing flashed across the screen. I was stunned, especially when I found out that the bombers were Americans, and both former soldiers. I could not imagine American soldiers turning their hatred agains the government into an act of terrorism. They killed 168 people, including babies and young children in the day care center were killed, hundreds of others wounded. McVeigh and Nichols were part of the anti-government so-called “militia” movement that still exists in parts of this country, of which the Bundy family, which occupied a Federal Wildlife Sanctuary in 2016 in order to bring about a revolt against the government is part. Sadly, there are such people who would do the same today if given the chance. As this attack shows, most of them are not Islamic terrorists, but some are plain old Americans, people you might see in the grocery store or at the gas station. Some belong to the White Supremacist and Neo-Nazi Alt-Right, others to heavily armed self-appointed “militia” groups, and still others simply deluded followers of conspiracy theorists like Alex Jones. Members of all of these groups or movements have committed violent acts or have been stopped from doing so by the work of the FBI and other law enforcement agencies. What is scary is that almost all of them repeat the same words, thoughts and ideology that McVeigh wrote about before and after the attack. In the end McVeigh rationalized his violence and defended his actions, never showing any hint of remorse for his victims, they were simply collateral damage, and the children he killed, a distraction from his message. Those that interviewed him said that he seemed completely normal and it was hard for them to reconcile his normalcy with what he did and his attitude toward his victims. I find it sad to see others like McVeigh doing their damnedest to impugn the character, honor and work of the men and women of the FBI. Unfortunately they have found a friend in President Trump who impugns the honor, decency, and loyalty of the FBI, members of the Justice Department, and Federal Judges; not to mention his political enemies and the free press. The trouble with McVeigh was precisely that so many were like him, and that the many were neither perverted or sadistic, that they were, and still are, terribly and terrifyingly normal. Timmy McVeigh did live almost literally next door. He was from the Niagara County, just over the creek from Erie County, where I grew up. I have friends who went to school with the McVeighs.